List of Best Books for young Children who live or visit with an adult who has Alzheimer’s dementia or other Memory Loss. To alleviate fears of Alzheimer’s, dementia, catching-it or dying, we only need to talk to the young child. Read to them and be as honest as they can understand. Listen listen to them and discuss their thoughts and fears. You might be surprised if you really listen to a small child. We often take for granted that they understand everything we say, but often they don’t understand at all. When they see someone who is ill, they assume they will be ill too. They often think they did something wrong that caused a loved ones illness. A child tends to take responsibility for everything in their life. If you have a lengthy conversation with a small child, you might be surprised to learn how they really feel about some things and situations in their life. If someone they know or love has Alzheimer’s or dementia this list of Best Books for children will help initiate a conversation and may encourage them to speak up and ask questions about the things they don’t understand. The information delivered in Ms Jordan’s book couldn’t come at a better time. In the next few decades hundreds of 1,000’s of baby-boomers will be facing decisions about dementia for themselves or a family member. 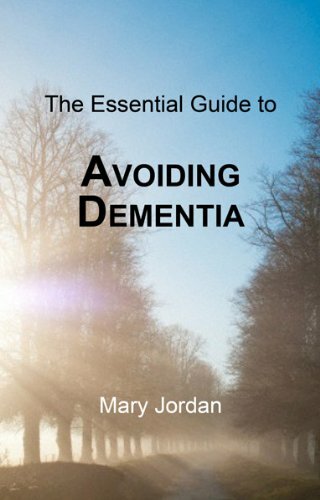 In this book Mary Jordan explains each kind of dementia and many of it’s causes and symtoms as well as things to do to lower your own risk of dementia. She talks about personality types; which ones are more prone to dementia, and which existing traits that tend to become more pronounced if one has dementia. She talks about lifestyle choices; alcohol and smoking and the increased risk to dementia that each causes. And she examines Stress and Trauma, Psychological Trauma, mental illness and hearing loss. I was particularly impressed with Ms Jordan’s authority on hearing loss as my own mother suffered with hearing loss for many years prior to her Alzheimer’s diagnosis. Yet, I’d always felt the two were definitely related. Ms Jordan helped me to accept, they probably were, as those with severe hearing loss lose a sense of understanding their environment and that’s exactly what happened to my Mom. She also discusses the things you can do to lower your risk of having dementia; such keeping a broad social network, staying active physically and mentally. The more you do to expand your presence and life, the more you lower the risks. Variety in a busy life seems significant. Mary Jordan provides Studies and Trials that discuss the brains plasticity and cognitive reserves that may be a factor in lowering risks of dementia. As books title states, Mary Jordan shares a plethora of ways to avoid or lower risks of dementia. She talks about Exercise, Nutrition, Vitamins and their impact on dementia. She discusses Fats and Cholesterol and tells the reason why we need both for a healthy lifestyle. Besides the Risk Factors, Remedies and Causes of Dementia, Ms Jordan also gives us an up close look at the brain, itself. She gives a description of the brain and tells it how it works, including an eye- opener about the brain’s elasticity and creating new links to neurons when old links have died from dementia. I found it fascinating to learn about different behaviors by the person with dementia caused by damage in different areas of the brain. For example: In front-temporal dementia, damage is focused in the front brain. With this dementia, only personality or behavior issues occur in the beginning– memory problems don’t become obvious till much later. Each area of the brain affected, causes it’s own unique behaviors. More evidence that the person with dementia has little control of his own behavior. Also included is a storehouse of Resources. Since Mary Jordan is from the UK, many are located in that area. She also has an Outstanding Glossary: Including all things related to dementia. This book is a must-have for everyone because it is surely an Encyclopedia of dementia, an epidemic we all face in the coming years. Author: Mary Jordan works for a national dementia charity and has had considerable experience caring for elderly relatives and friends who have suffered from dementia. Previously, she worked in the NHS for 9 years. Earlier publications include books on Caring, End of Life and on GP Practice Management in addition to articles in nursing and social journals and magazines. Find her at: @HHealthBooks on Twitter.